"This is a vodka version of a dark and stormy." Fill a tall glass with ice. Squeeze 1/2 lime over ice. Pour vodka over ice and top with ginger beer. Garnish with lime slices. My favorite al time cocktail!! This was great! Just need a copper mug! My new favorite drink that I first had on a cruise a few months back. So refreshing. Made this exactly as written with a slice of candied ginger on the glass. Yum. 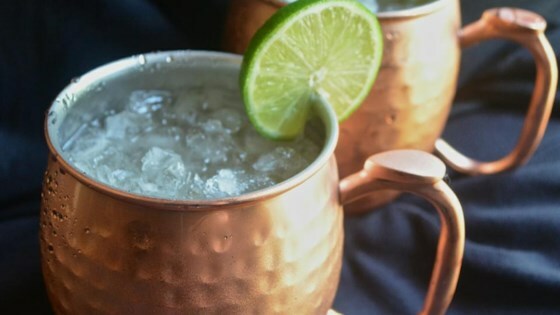 If you want a light, easy drink that goes down smoothly, you simply cannot go wrong with a Moscow mule. It is so delicious and takes seconds to make. I love this drink! I LOVE these! I make my own ginger beer from a "ginger bug". I make my ginger beer very spicy and sometimes add a little tumeric root to the ferment. Yummy!